If your organization is struggling to build and sustain improvement momentum, consider adopting the AME (Association for Manufacturing Excellence) Lean Sensei app as a key resource. Employing this dynamic app can help you to engage your associates in assessing lean progress and creating paths to long-term continuous improvement (CI). Such shared understanding, rather than preset rules handed down by senior leadership, makes a crucial difference in the quest for a CI culture, according to Jason Otts, plant director at the Bath Fitter plant in Springfield, TN. Associates there, several years into their lean journey, use the Lean Sensei app as a complement to the company’s Bath Fitter Management System (BFMS). Their goal – in addition to day-by-day lean progress supporting the company’s overall business success: Develop needed capabilities as they apply for the AME Excellence Award. Springfield associates manufacture custom tub and shower enclosures. 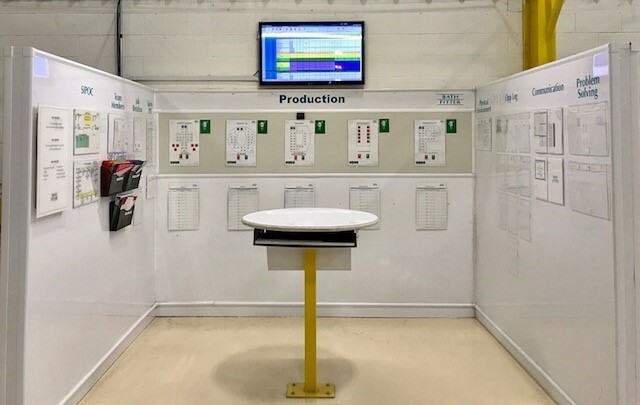 Otts explained that the Bath Fitter Springfield plant began using the Lean Sensei app as it was being piloted two years ago, scoring various site functions’ performance as A, B, C or D. These initial results drove numerous improvement activities in functional areas. The app, available to any organization that wants to improve the way it improves, offers a framework for benchmarking against previous AME Excellence Award recipients’ performance. Organizations can tailor how they employ the app to evaluate current performance, gain understanding about their company’s rank against the benchmark, develop improvement plans and review/celebrate lean progress. Gathering improvement ideas from associates yields the best suggestions for improvement, Goodrum commented. Department meetings, group discussions and use of A3 (problem-solving) forms generate useful ideas. “We want to implement their ideas, not just dictate changes,” said Goodrum. The plant’s opportunity logs, CI suggestions for safety, productivity, etc. improvements, are documented on a shared drive that is accessible to all employees. Ideas are reviewed to make sure they are cost effective, and then all implemented suggestions are posted in the plant. The opportunity logs are reviewed quarterly by management, and those with the greatest impact on the business net an associate a $100 gift certificate, a special parking space and a star award. One of the quarterly star award recipients is selected annually for additional recognition, including $1000 worth of gifts/certificates tailored to the employee’s interests. With a nod to the well-known Pike Place Market in Seattle, Bath Fitter folks adopted their own “fish philosophy.” Whenever an associate wants to recognize another associate for “going above and beyond” within the facility, or perhaps for providing personal assistance to others, they put a paper fish thank-you note on a large wall in the plant, noting the outstanding associate’s name and achievement. “It helps to build camaraderie,” said Goodrum. Fish notes are also shared with associates during monthly communications meetings. Richter cited improvements related to visual management as an example. “We converted KPI (Key Performance Improvement) metrics adopted from this program into a KPI measuring system that we use across the plant (safety, quality, delivery, improvement, productivity, etc. ),” he said. “Now all departments use the same metrics, and we’ve seen improvements by floor associates that they shared with senior management. Management was so blown away with this program that they rolled it out to all of our retail locations in the United States and Canada.” Associates at all the sites can see how their location is doing by checking updates posted on boards, enabling them to evaluate the data and determine whether remedial action steps are needed. The BFMS system was successfully shared at the Bath Fitter facility in Canada, where associates are primarily French-speaking. CI reports and KPI updates posted in work areas reflect current progress. “It’s a user-friendly, uncomplicated process,” Richter said. “Using the Lean Sensei app and our visual management approach – including adoption across our retail network – has improved our business.” The quality department catalogs improvement activity actions/results, and makes them electronically accessible to all associates. Bush said the Springfield plant hosts many visitors who can readily see current performance in various areas. Also notable: before-and-after photos are prominently posted in the plant, reflecting progress during the past two years’ time. Another reflection of employee engagement: Continued focus on employee training. More than 90 percent of the Springfield associates are skilled in two or more plant jobs. When asked about “lessons learned,” for the benefit of others using traveling on the lean journey and using the the AME Lean Sensei app, Otts suggested, “Don’t try to launch too many improvement initiatives at once. Take small steps, involving everyone in the process. That’s important for sustaining progress. Sometimes, you may need to go back to first step. Lea Tonkin is the president of Lea Tonkin Communications, Woodstock, IL. For more information about the AME Lean Sensei app and Excel tool, including a link to download, be sure to visit the AME Lean Sensei webpage. You can learn from the experts who helped pioneer AME Lean Sensei at the AME 2017 International Conference in Boston. Visit ame.org/Boston for more information! To stay up-to-date on all things AME, join our mailing list!